I wasn’t aware that there was an option to sell it on after so-many years , nor of the option to do holiday-lets for part of the year . The One is troubling , as the economic situation in Greece shows no sign of being able to improve for decades ( plainly the Politicians didn’t care for professor-minister Varoufakis’ expositions on economics , but then he IS of Cretan background . If the matter of the house IS left essentially as ” Pending – too difficult ” by the Benaki , then I can well envisage a situation where the place is simply eventually sold off as the easiest way to get rid of a minor headache and to put a little cash in their till . But the other option is quite positive ; – allowing that the 10 to 12 weeks July+August+early September would be generally climatically difficult to write in , it would be possible to rent the place out as a staffed holiday let to the very-well-heeled ” glitteratti “at a premium rate ; – except that THAT economically happy subset of humanity are unlikely to regard hordes of Grockles ( tourists+fans ) touring the ” Museum ” bit of the premises as desirable . Tricky one , but not insoluble . As I’ve said to you before , if a leaseback arrangement could be arranged with the Benaki , whereby THEIR name still appeared on the top of the billing , but a U K based trust was actually relieving them of all the work and of all the financial burdens and the day-to-day management of the repair+rebuild+reoptimisation AND ongoing management of the new ” P L F Centre ” ( or whatever the place is to be called ) , then that could probably be quite acceptable to the Benaki . It’s a couple of years now since I last visited the museum in Athens and chatted with some of the staff there , but the ones I spoke to thought that might well be a fair-enough solution back then , and little has changed , financially , since , except that things are now worse . We also have to bear in mind that the Benaki’s director , Dr Delevorias , is no stripling , and it is necessary to consider the impact of a possible imminent ” new broom ” upsetting apple-carts ( If you’ll forgive mixed metaphors ) . say a plumber , a sparky , a chippy , plus someone who has done masonary conservation on historic buildings ( the house was built the old way ) and finally a good practical building-services techie . Get them into the loft and cellars , lifting hatches , floorboards , prodding about with bradawls , and pointing torches into voids and down drains , photograph video and draw everything , and then get a really good defects list put together ( rather like English churches have with their Quincennial Architects inspections documents , everything defective meticulously listed as a rolling series of five-yearly inspection and report ). The team should be in and out within 4 or 5 days ; say a week maximum all told including the travelling . Sell it to them as a free holiday , so they wont want paying ( much ) , and it’ll be a lot cheaper AND a lot sounder than hiring Consultants . The report wont be as glossy , but it’ll be a sight more use . And while there , they can go through any architects proposals that have been drawn up , with a fine toothcomb and the skeptical eye of experience , to wring unnecessary expense and patent impracticalities out . That would give the project a very firm base to proceed from , secure from most nasty surprises . The trust seem to be doing the thing the other way round ; – Great and Good ? appointing lawyers and architects first . Its the expensive way to go . For goodness sake let it out! It could be a revenue stream for the museum rather than a liability. Alternatively if the museum has no interest in it, perhaps they should sell it to perhaps the trust as a matter of urgency. – Many fans of Paddy’s work would love to stay here and would respect it totally. was most apropos, not only by its traditional life style but also because it was the locale for the radio shack of Tom Dumbabin, Paddy, and the rest of the crew. Paddy had invited me to bring the video rig and come visit him in January of 1990, which could have been a real jump start. 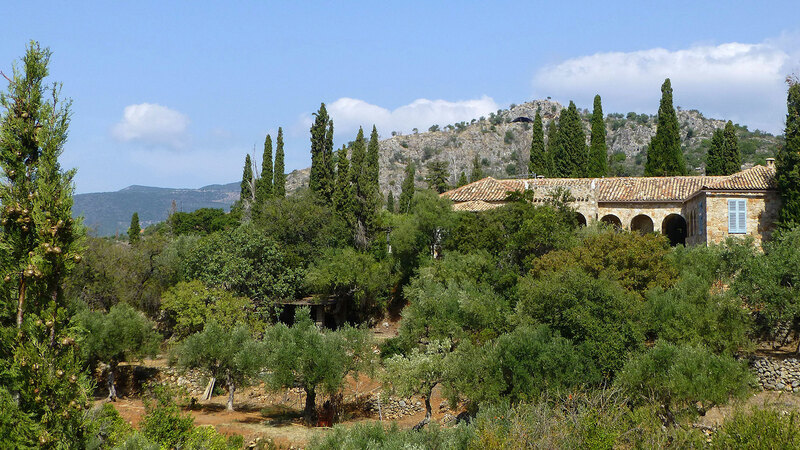 However, personal matters had suddenly erupted for me and, while I made several trips back to the Amari to document the slow but steady destruction of the valley’s ancient olive groves, Joan’s death and Paddy’s illness cut our lines of communication. If someone or institution had the way’s and means, a video document of deep interest could yet be assembled from the living, the photographs, and the stories of the Cretan villagers. helped him in defeating the Nazis and today are fighting to save their way of life – as also is all of Greece. or call me at 360-297-2624 in Kingston, WA , USA. When a gift is given without an endowment, the end result is often what we have here. Did the house in the UK ever sell? And if it did, where did that money go as Joan and PLF had no children? Maybe, that money could have been used for the house in Greece, but this was not set out at the beginning. Last month I was fortunate to be given a tour of Patrick and Joan’s Kadamyli house by the lovely Kyria Elpida, who speaks with great respect and affection for the couple. She is there daily airing and caring for the housekeeping of the home of her beloved past employers (and friends). Of course, it became the home of an elderly couple who (one might imagine), did not have renovations at the top of their priority list. As such, the Benaki Museum was endowed with a wonderful potential gift, but one that needed planning, adaptation and considerable investment to make it fit for its future purpose. Greece being my heart home, it is not difficult for me to understand why Paddy and Joan chose that country and in particular Kardamyli (Kalamitsi) for their settlement. Αnyome fortunate to have been touched by the magic of Greece and its peoples will know what I mean. The house and its grounds seem to embody that perfect blend of humility and natural grandeur that is Greece (and perhaps Paddy and Joan too). PLF did not of course intend his bequeathment to be a museum to his past, but as a place where others may learn and create; and thanks to the Benaki museum and the newly formed PLF Society, there are many good works going on behind the scenes to make this a reality. Perhaps the Benaki Foundation is inefficient or even useless, but the bigger picture is that the people of Greece are in a precarious financial state; within days many people there may not have enough money to buy essentials. Why not instead facilitate a sale of PLF’s house to someone who can afford to buy it and pay for its upkeep? PLF’s legacy is his writing, not his house; that he may have thought otherwise himself should not be the determining factor – after all he did not provide an endowment. And finally, why not pay the proceeds of sale to a deserving Greek charity? @Willie Scrags ; – The Benaki Foundation is neither inefficient nor useless, but the present economic crisis in Greece did catch the organisation in a situation where it had just greatly expanded the work and commitments it had in Athens , and the bequest of a rather tired large house way out in the wilds of the Mani undoubtedly got put in the tray marked mentally as ” Pending-Too Difficult ” as little more than a damn nuisance , as an additional worry to add to the burden . For more than five years the Benaki has been struggling to survive and continue with it’s core functions, in a situation where Greek Government support evaporated like summer snow , staffing had to be cut back savagely, and budgets for all but essentials cut to zero . Do what I did – go see the staff in the museum in Athens and discuss the subject of the house and how the crisis has affected all the Benaki does ; they are quite helpless to do anything in the current climate . as I have said to Tom before , I think PLF was a bit naive (at best) and a bit of a nit (at worst) to hand the place on without arranging financial support , but that bequest was made in better and more prosperous times when the present catastrophes could not have reasonably been foreseen . The ” Elephant in the Room ” everyone seems to studiously ignore is the ongoing £££££££ income from PLF’s literary estate . One wonders where ( in the absence of widow / children / other dependents ) all that ends up at present , and quite why the begging bowl is being brandished at us with QUITE so much fervor , given that the ball-park estimates of the funds required to repair / refurbish / re-optimise the Kardamyli house are only about the ( suspiciously round sum ) of a £ Million or so . I’d be happier considering adding my own widow’s mite to the pot if I knew that a bit of the income stream which HE created was flowing towards carrying out his wishes regarding his house . Thirdly ; – the idea that writers could work , undisturbed , in the same ( un-sound-proofed ) building at the same time as ( anticipated ) tourists and fans are roaming the building is plain silly . My advice would be to fully repair and restore the house AS WAS , and then do something rather like has been done with Rudyard Kipling’s house at ” Batemans ” ( see online or visit it ) – i.e. Make it into a sort of income-generating museum ( with BOOKSHOP of course ) with Exhibition and Educational spaces , and to keep the place alive , a dining area for due conviviality . Day visitors will need a loo block and car parking , (tucked into the remotest possible corner of the site ) and as any Visitor Attraction Manager in the UK will confirm , the secret of success will require a cafe selling Really Good Homemade Cakes . I would propose that the Writers should actually be accommodated in a SEPARATE NEW BLOCK , a little away from the house . In an area of the grounds closed to day-visitors , this would be constructed and equipped to fully modern standards in all respects , but with an external appearance and size that would be carefully styled to empathise aesthetically with the original house . Not a Carbuncle , you see ? . Those ” studios ” ( say two floors of six = twelve total ) would be fully en-suite + mini-kitchenette , air-con fitted , sound-proofed , study-bedrooms , designed and built for purpose . THAT plan would be much more efficient and cost-effective , and would give you maximum preservation of Paddy’s house . It might even work out cheaper and easier in the long run . AND it would fulfill his wishes in a much more practical and comfortable way , for the writers he envisaged using the place . They’d be using the house for their leisure and relaxation hours , but not to work , sleep or ablute in . I am afraid I view the Trust that has been set up in the U.K. with great skepticism . Fine that an Architect has been appointed , but do THEY ” speak Greek ” in the same sense ? The project could so easily become a money-pit ; – very many of the infrastructure projects carried out in Greece in the last quarter-century ( and which contributed hugely to the present economic woes ) were tendered for at greatly inflated prices , the illicit profits of which were shared between the corrupt contractor and those accepting the tender . Add a dendritic network of subbies and their subbies , all at the same game , and you see the possibilities . I think a situation where an organisation is effectively commissioning and/or paying for works from London , but at arm’s length , through the Benaki Foundation in Athens , to be carried out by local contractors and subcontractors in rural Greece , under local site management by sub-contracted Greek architects and site inspectors , would make the average Greek builder a very happy man indeed . And how ever are you going to do due diligence on the works and ensure good quality work , proper materials and value for money ? but you are going to try that in the Mani ? Really ? There is a general tradition in Greece called ” Klepsi-Klepsi ” ( which translates something like ” Thiefy-Thiefy ” ) in which it is generally considered socially acceptable to take golden opportunities to profit from Mugs , and from weak monetary controls . That is NOT to say that all Greeks are dishonest – far from it , but very many will succumb to temptation , given that it is business , not personal relationship , and that some fool has created an opportunity . I very much fear that the Trusts funds will prove an irresistible lure . One further point Christos – after ten years the Benaki can sell the place. Who keeps the funds? They could just drag this out until then. I suggested to Artemis and Colin Thubron that a better approach would be to put together a good business plan. If that seemed to stack up then lease the place from the Benaki (gets them out of the equation and provides them with much needed income) and then maybe buy it from them at a negotiated discount price in 2221. Run it on professional Anglo-Saxon business lines but in line with Paddy’s wishes which also included the option for the place to be let to holiday makers for certain periods of the year. Such a model could probably work and I am sure many people would love to rent it.